Home Headlines Four Factions, One Destiny in the Awesome New Unity RPG! Four Factions, One Destiny in the Awesome New Unity RPG! Today we’re pleased to announce the print pre-order and PDF release of a brand new roleplaying game, Unity from Zensara Studios. 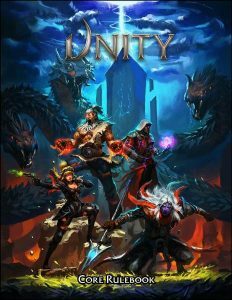 The Unity RPG is available to pre-order now in print shipping in late September, and in PDF which is available immediately. Print pre-orders also receive a free PDF on completion of order and there’s also a FREE 40 page sampler with rules, art and background, so you can check out the game, plus a free character sheet. But we’re sure you’ll want to hear more about this intriguing 371 page RPG which features gorgeous full colour artwork, so on with the details! Explore the forgotten remnants of a once Golden Age when mortals rose to challenge gods. Rediscover long forgotten ancient technologies that blur the lines between reality and wonder. Stride atop colossal mechanized machines of war from a bygone era. Embrace the discovery of new and exciting cultures in a scarred landscape full of secrets and hidden beauty. 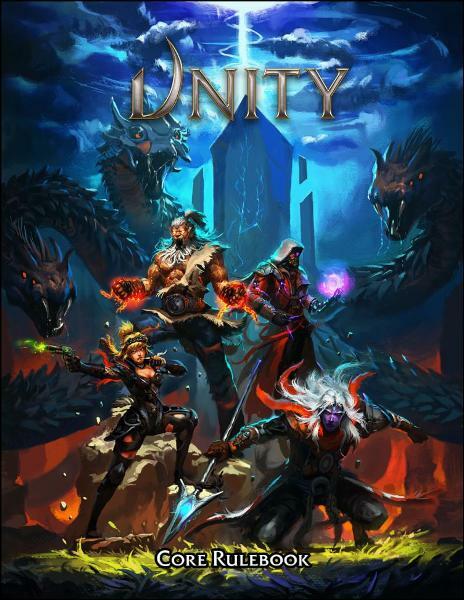 Unity is a fantasy roleplaying experience focused on spectacular storytelling, cinematic moments, deep character growth, and a riveting combat system that encourages you to combine your powers with your allies to overcome impossible challenges. Full roleplaying rules for character creation, adventuring, and combat. Full setting guide that explores the world of Unity and its rich history. 4 Factions complete with cultural write-ups and short stories. 9 Classes and hundreds of power combinations to master. Mysterious and perilous locations to explore.